Photographing the Milky Way is not as hard as it looks. With a little patience and practice, anyone can capture decent looking images of the Milky Way using just a DSLR camera, a wide angle lens, and a tripod. If a timer, also known as an "intervalometer," is added to the setup, then exposure duration can be increased to gather even more light and detail. To get the best Milky Way images, tracking the sky is required to maximize exposure time while avoiding star trails. This guide will go over the different methods of photographing the Milky Way. - intervalometer (timer) - Not necessary, but it's extremely worth getting one! A wide and fast lens is preferred. Look for one with a focal length of 35mm or less to capture wide swaths of the Milky Way. Apertures of f/3.5 are effective, but if you are shooing from a static tripod, that is, not tracking, then lenses of f/2.8 or faster are preferred to gather an ample amount of light in the time allowed. An intervalometer, or 'timer,' will act as both a remote shuttle release and as a tool to allow your camera to take long exposures. The timer can also be used for other areas of photography such as creating time lapses and taking multiple images for stacking during astrophography. Timers can be found for your camera for around $25 on Amazon.com. Be sure to get the correct timer for your camera model. You’ll need a place that is as dark as possible. This means far away from any city lights. You may have to drive for a couple hours to get to a dark enough location, but finding a place that is very dark is necessary. Also consider how much moisture is usually in the air at your chosen location. Shooting the Milky Way next to an ocean or in a humid environment can be done, but the results will never be as good as the same setup in an arid region such as a desert. If you have the luxury, choose a location which is high in elevation. The higher the camera is, the less atmosphere the light from the Milky Way has to pass through to reach it. Last, keep temperature in mind. Shooting at the desert isn’t so great if it’s the middle of summer and 100 degrees Fahrenheit at two in the morning. Typically if you can shoot in 60 degrees Fahrenheit (~15 C) or less you’ll be good. If it’s any warmer the images may be noisier than you’d like. Of course, if you’re shooting in below freezing temps, but sure to look after your equipment! Use planetarium software or an app to determine where to find the Milky Way at what time. Two great smartphone apps we use are Star Walk and Pocket Universe. Choose a time when the moon will not ruin your shot by making the sky too bright. The best time is near a New Moon, but first and last quarter moons can still work if you plan around them. Photographing the Milky Way is not recommended during or near a Full Moon because the sky just isn’t dark enough in any direction at those times. Getting sharp focus is essential for producing large prints from your images. The easiest way to focus a DSLR camera during any type of star photography is to turn on Live View mode and point towards a bright star. Zoom in on the star using your camera's display screen controls (do not zoom the actual lens) and adjust the lens focus until the star is as close to a point as possible. This method is very effective but requires patience as most stars can be difficult at first to locate on the display screen. Now that the focus is set, be careful not to bump the lens as you shoot throughout the night. To be safe, you may want to review each photo (zoom in on a star to make sure it's close to a point) and recheck the focus in between different compositions. Aim your camera in the rough direction of your shot and set the ISO to an absurdly high setting. This will allow you to take a relatively short exposure (~5 - 10 seconds) to quickly check and adjust your composure. For instance, you may want to check that any landscape in your photo is aligned horizontally. Adjust your composure and repeat until you have the shot you want. Now it's time to get your shot! You'll want to play around with ISO settings, but using 1600 or 3200 usually works well for getting a good signal to noise ratio. Open up the lens aperture all the way, and set the exposure time on the timer using the chart below. This chart uses the "550/350" rule, that is, if your camera has a full sized sensor, then 550 divided by your focal length will give you the approximate maximum exposure time before star trailing occurs. If you're using a camera with a cropped sensor, use 350 instead of 550. If your exact focal length isn't listed, use the formula listed to calculate the exposure time. Set a 5 second delay on the timer, press the button, and gently place the timer down. It's good to wrap the timer cord around the tripod so it's not dangling and can't swing in the wind. The entire setup must remain still while the camera is capturing the image. The biggest constraint when doing Milky Way photography is keeping the stars in sharp focus while trying to capture as much light as possible. Since the stars will begin to "trail" after a certain amount of time on a static tripod, tracking the sky is necessary to increase exposure times while maintaining pin-pointy stars. If a motorized mount or manual barn door style tracker are used, then your camera will be able to move with the rotation of the Earth. This allows you to obtain much longer exposure times before star trailing occurs. When using tracking equipment, there are several advantages in addition to being able to capture more light with a longer exposure time. The lengthened exposure also allows the lens aperture to be closed down a bit. This increases your depth of field, but more importantly it will provide your shot with greater image detail, and less optical aberrations and distortions. Longer exposure times will also allow you to experiment with a wider range of lower ISO settings to reduce noise. When taking a tracked image of the Milky Way, the foreground will be slightly blurred due to the camera movement. To get a focused image of the foreground, stop the tracking system and readjust the focus for that area. Take a long exposure of the foreground until you're satisfied. 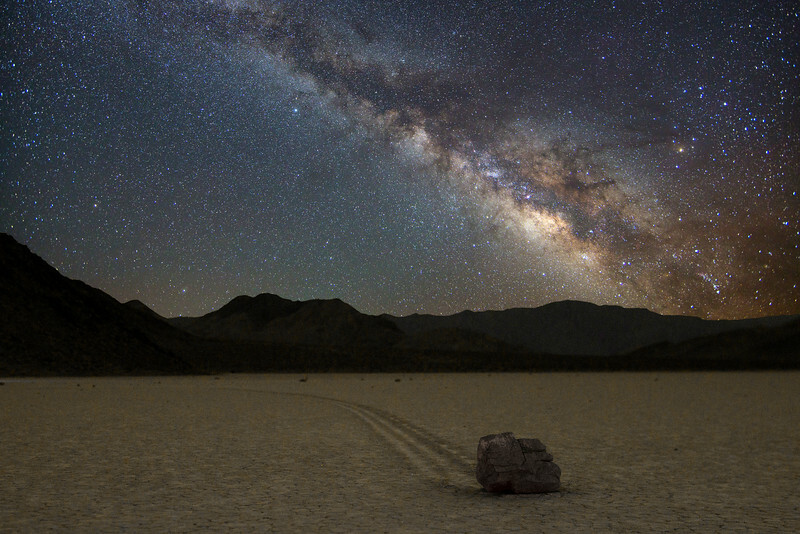 You can later combine the foreground with the tracked sky to create the ultimate Milky Way landscape image like the one pictured above featuring the Racetrack Playa in Death Valley, CA.